It's been a while since I've sat down and shown the process of making a puzzle, mainly because I've been busy in the shop working on making puzzles, and haven't had time to write, however the Really Bent Board Burr by Derek Bosch is one that is worth writing about. I've never owned a copy of this puzzle, and it has always intrigued me. I've talked about making copies for long enough, and now I finally have, so here's a little bit of insight to the puzzle, and the process of creating it. 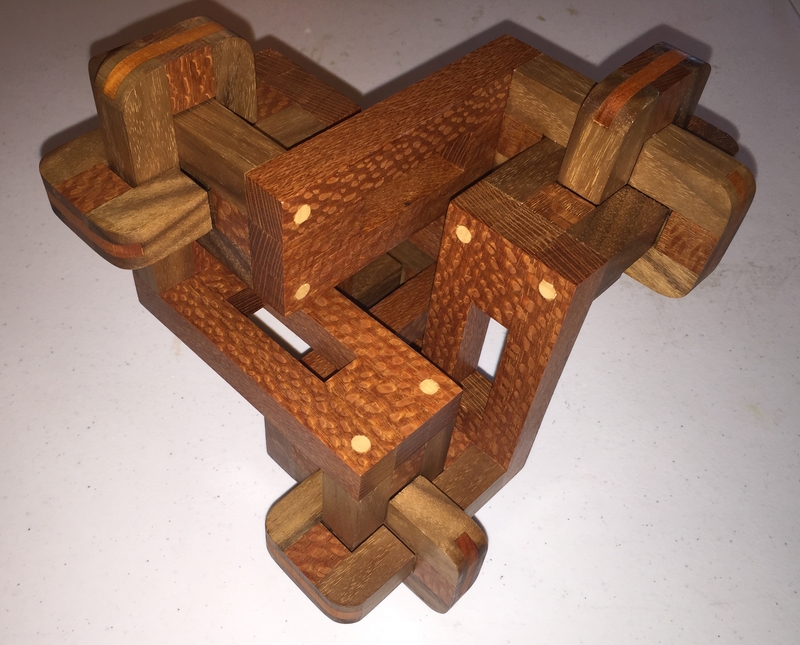 The puzzle was originally produced by Tom Lensch back in 2007 and the craftsmanship as you'd expect was superb. Hopefully I'm able to do it justice, but I'll let you be the judge of that. 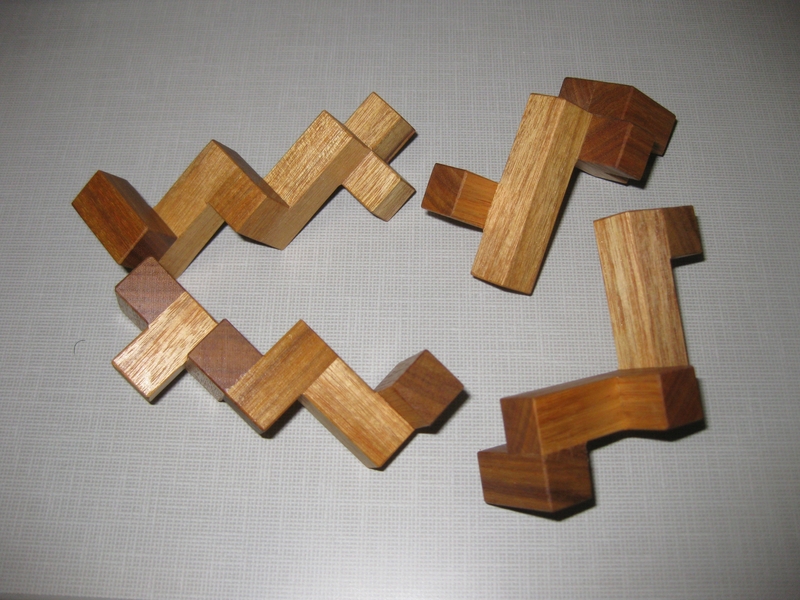 The pieces form a set where three of the Z's have the C's attached with the opening facing in opposite directions, two with the opening in the same direction, and the final is a mirror image of the second piece type. Given the length of the C's and the minimal gluing surface to the central structure, the joints need to be reinforced to prevent them from breaking. Equally, the end of the C's need to be reinforced to prevent them breaking too. All told there's a lot of work to producing such a puzzle, however the end result is in my opinion worth the extra effort. The start of any such puzzle is with the preparation of the stock. Square sticks need to be accurately milled from the boards giving straight, consistent sticks as a starting point. 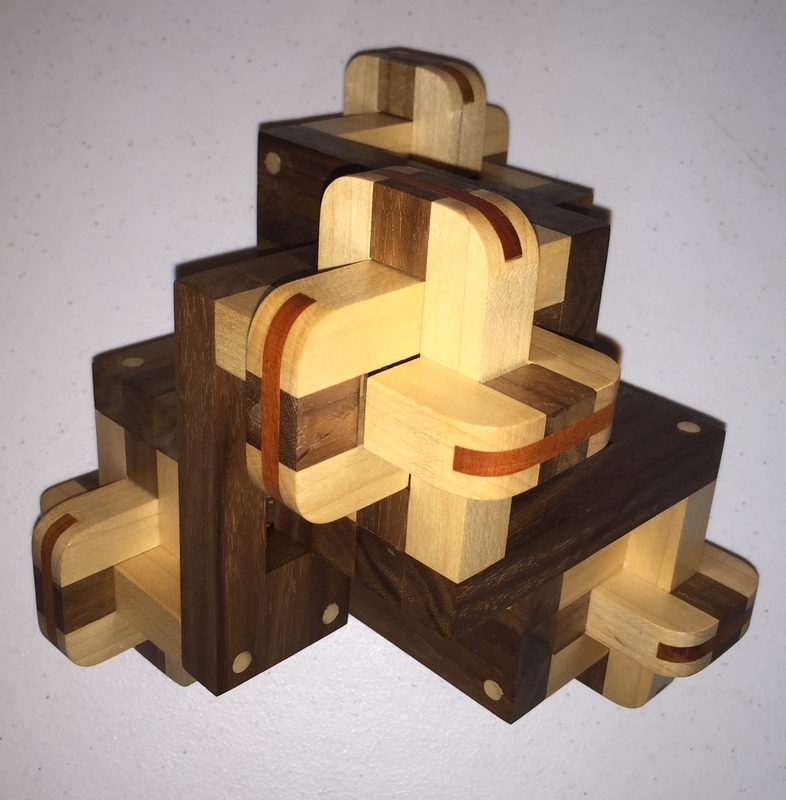 For this run of puzzles, I had a selection of Maple, Walnut and Lacewood to work with. Fortunately all the stock I had was 8/4, meaning that I could create sticks that were over 1/2" in diameter, resulting in a very pleasing and not small final puzzle. 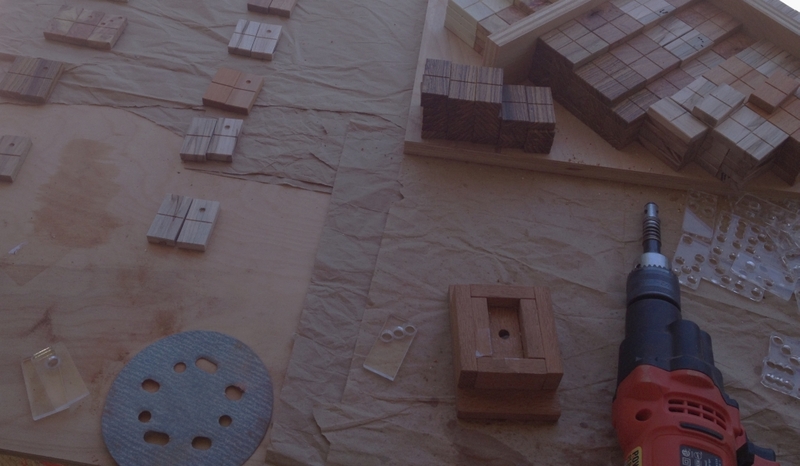 Overall, each puzzle requires 12 feet of wood to make, and 2 feet of dowel to pin the pieces ensuring they are strong enough. That's a lot of wood! You can see my cheat sheet in the image above, where I mapped out the pieces and produced a cut list for the individual sticks needed to create the final puzzle. 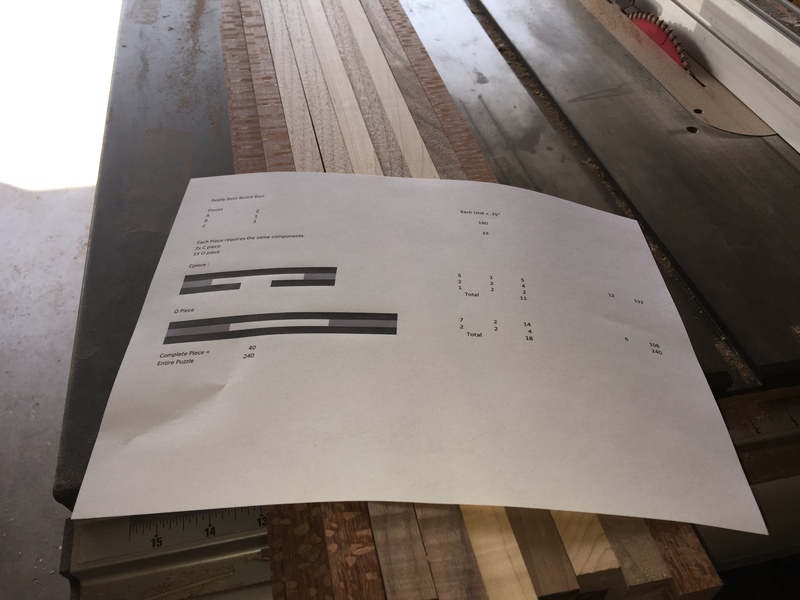 The colouring on the pieces on my cheat sheet is partly to make seeing each piece easier, but it also helps with the wood selected for each piece, resulting in a pretty interesting final puzzle piece. The size of each of the pieces is determined from the width of the square stock. 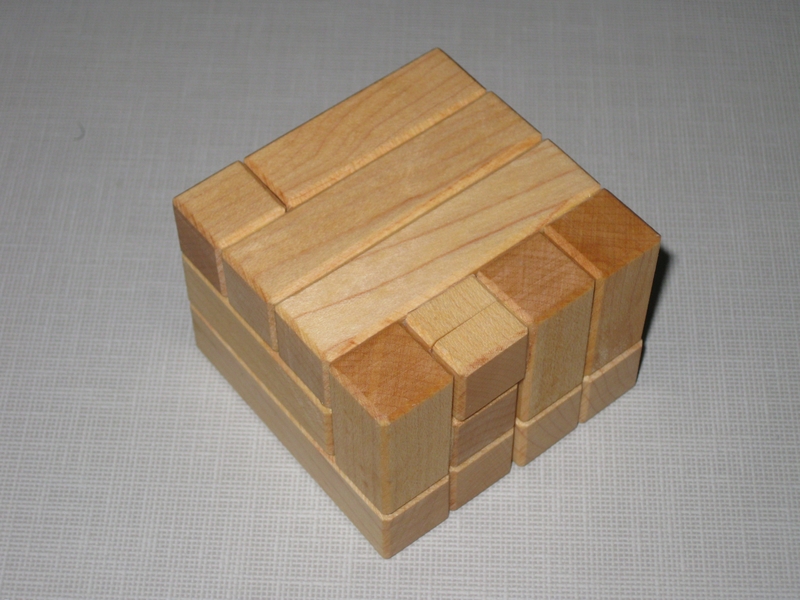 That sets the size of a single cube, and from there the units required are 1x1, 1x2, 1x5 and 1x7. I made a set of these pieces, which are easily created my combining the smaller units, all cut from the stock I'm using to ensure their size is accurate. You can see them in one of the photos below, sitting on my saw. 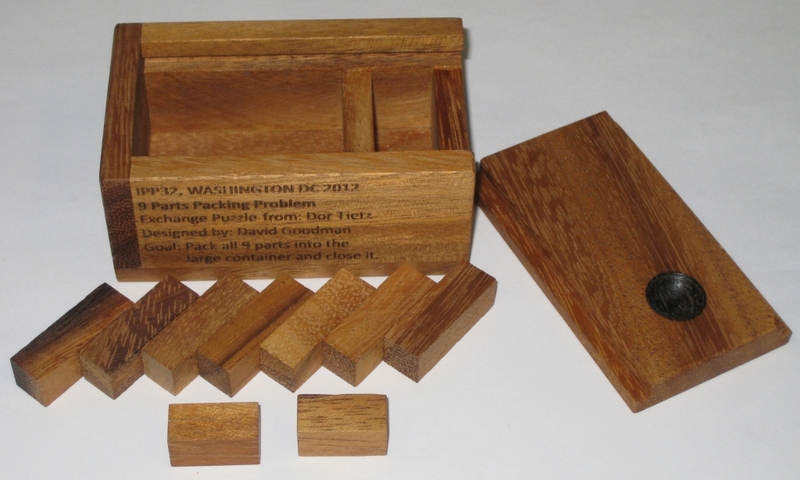 The square sticks are cut to the correct lengths for each puzzle in batches, and then stacked to create the pieces for each puzzle. 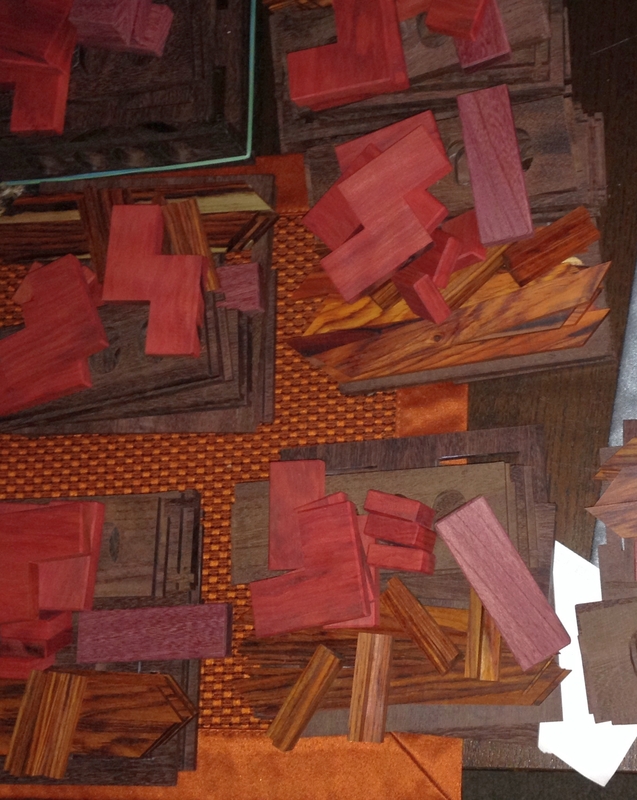 In total, I cut enough pieces for 10 copies of the puzzle to be made. As I've mentioned before, once the jigs are setup to make the cuts required, the effort to create 10 copies is not significantly more than to create one, so it just makes sense to make multiple copies. I'm sure there are people out there who will be interested in a copy. 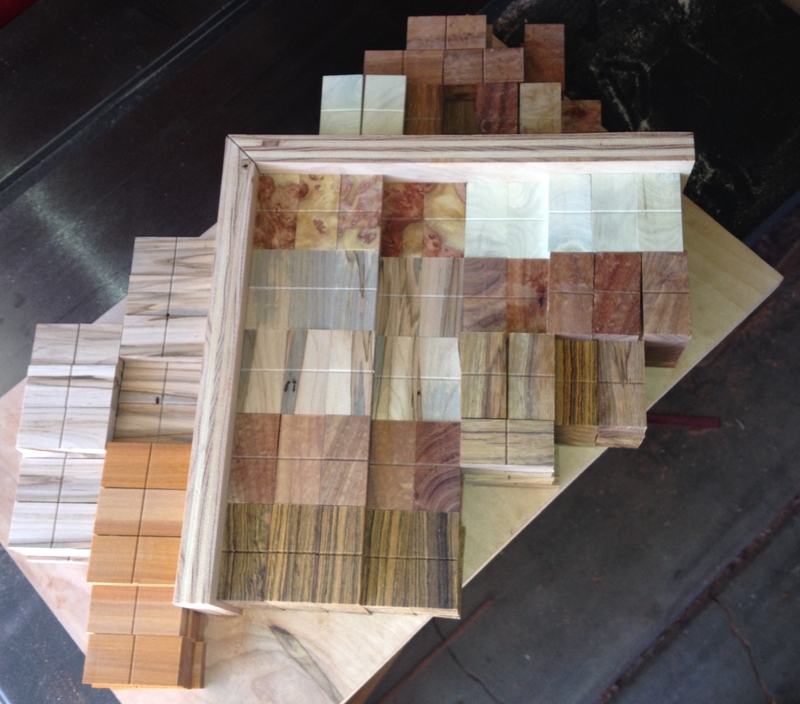 From each pile of sticks, the individual components of each individual puzzle piece are created. Since each piece consists of two C's and an O, those can be created en-mass, and then assembled into the correct puzzle piece. 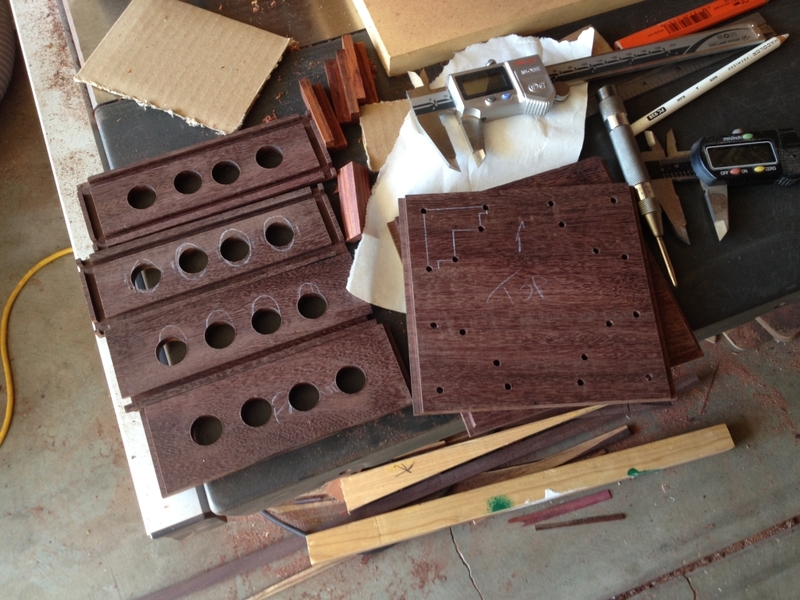 After the individual components are completed, they are glued together to form the final puzzle pieces, and then holes are drilled through the O's to allow dowels to be glued into place, forming a much stronger joint between the components and helping to ensure that significant force would be needed to break the pieces. At the same time, the pieces are run across the table saw to add a flat bottomed groove in the ends of the pieces to allow a spline to be added. That spline will reinforce the ends of the C's again helping to ensure that the pieces will not break when the solver is playing with the puzzle. These ends are very weak without some additional support since there is very little gluing surface, but lots of force available given the length of the pieces. 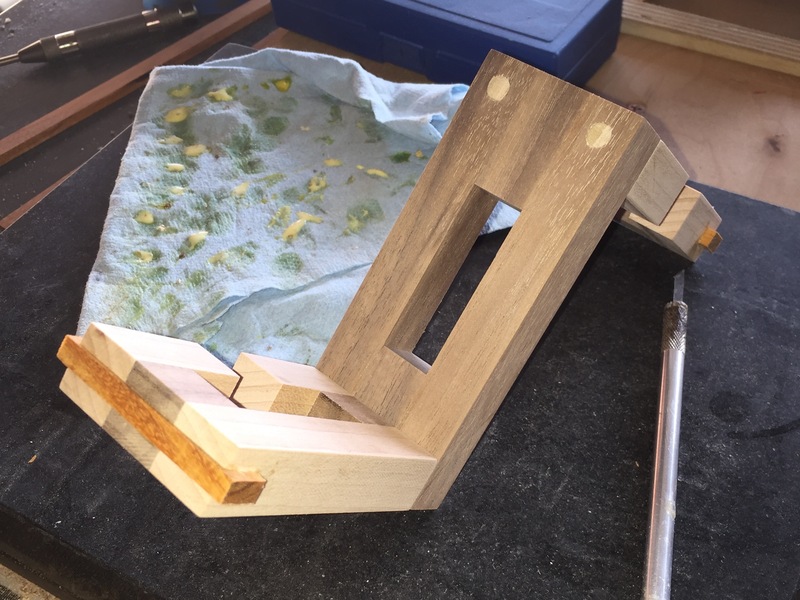 Once the glue has dried, the dowels are trimmed with a special saw which does not mark the surface the blade rests against, and the ends of the c-pieces are rounded to both clean up the spline, and add a visual element to the puzzle pieces in the assembled state. The other advantage to doing this is that is hides any tearout that was created from cutting the groove in the ends of the pieces. Normally I will back-up the cut with another piece of wood against the back of the piece where the blade will exit. This prevents the wood fibers which are unsupported otherwise from being ripped away from the piece, however with this type of cut that is very difficult, and taping the joint is only partially successful. So from my perspective as a craftsman, this rounding is both useful and pleasing to the final puzzle piece. At this point, the puzzle can be tested to ensure that all the pieces fit together. Unlike many other puzzles I've made there's no way to test the puzzle sooner. That means that I could have spent 10 hours making the pieces, and have nothing but scrap to show for it. 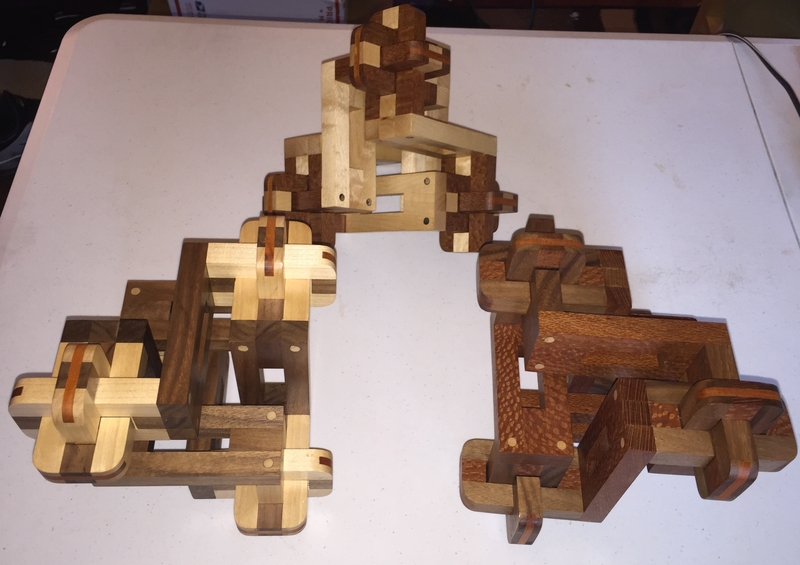 Unfortunately, the pieces are so long that without all the dowels and splines, they are not strong enough to be put together into the final puzzle meaning that it's an all or nothing build. Fortunately with the experience I have gained over the last few years, the puzzles went together without issue. 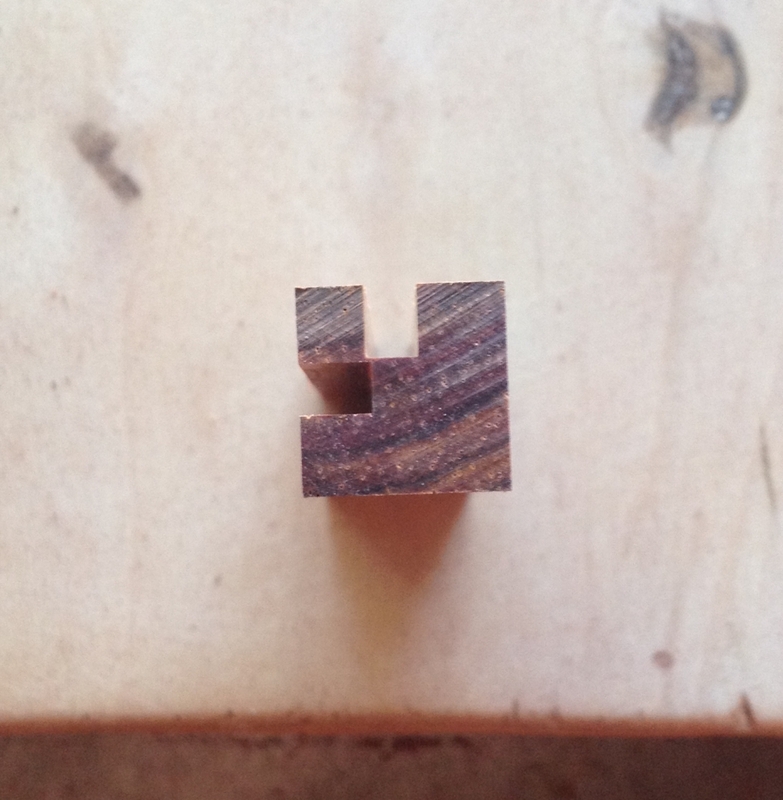 Only minor sanding was required in a couple of places on one of the puzzles to ensure a good fit. With the pieces tested and fitting together, they can be final sanded up to 600 grit to ensure a smooth and tactile surface, then finish can be applied to bring out the beauty of the wood. My go-to finish for puzzles is still a thinned lacquer then the Beall Triple Buff system to really make the pieces shine. That's about all there is to it. Each puzzle takes around 15 hours to make from start to finish, and I'm now very happy to have one of these excellent puzzles in my collection. They are a lot of work to make, and I'll be honest, as happy as I am to have one in my collection now, I'll not be making more of these any time soon! Hopefully the write-up was interesting, and hopefully I'll be back to writing more soon. I have time for one last review before I pack my bags and head off on my honeymoon (one year delayed). This time I'm back for another Vinco, in his mass produced line, Triangel. A clever packing puzzle that really seems to mess with my head. I picked this one up from Puzzle Master" a long time ago. So before you go correcting my spelling, the puzzle isn't called Triangle, it's Triangel. I didn't name it! 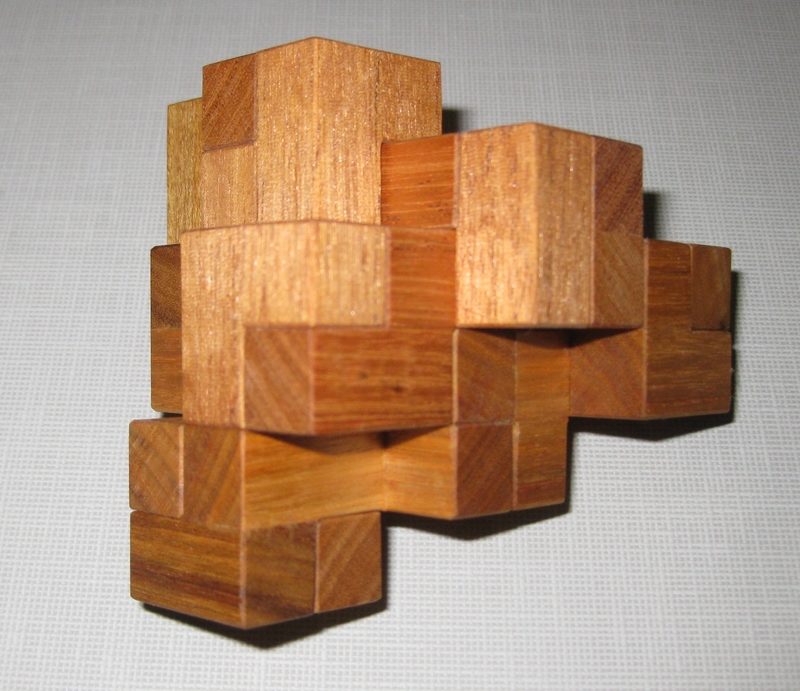 It's a 9 piece packing puzzle, where the pieces are not nice cubic pieces, but have been cut at some interesting 45 degree angles with all sorts of shapes created. 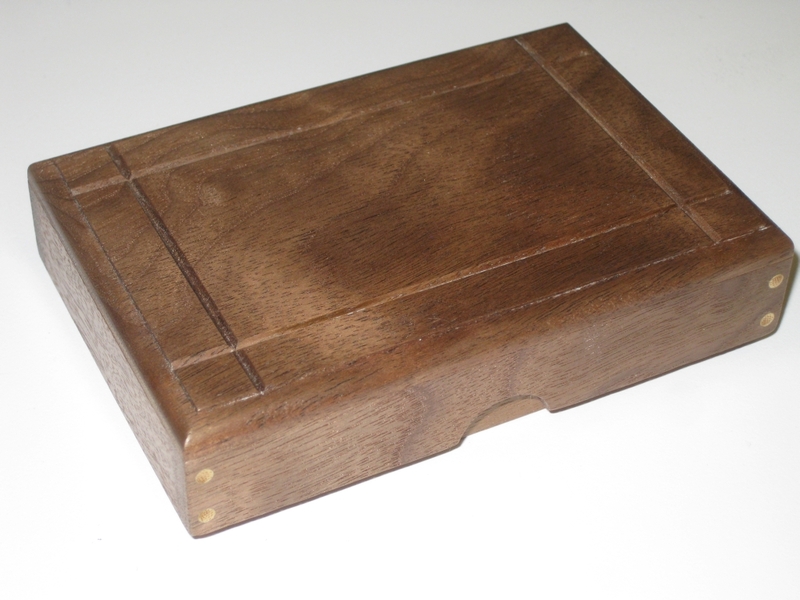 The tray is fairly basic, made from some Baltic Birch ply, with some assorted hardwoods used for the pieces. 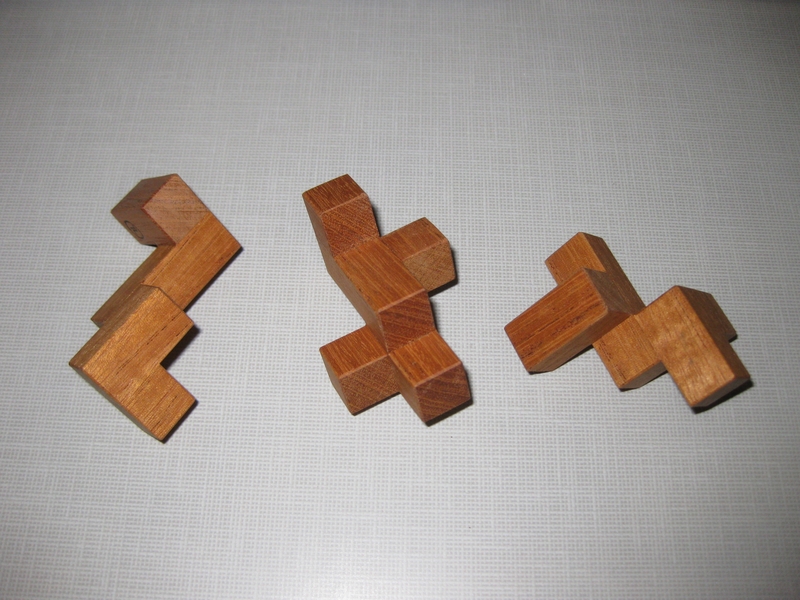 The puzzle measures 4.25" x 3" x 2.4" at the peak. With only nine pieces, you'd think this wasn't too challenging. Vinco lists it as 4/5 so fairly tricky. For me I found that the shape of the pieces really challenged me. Having done a lot of packing problems, working with square pieces, I seem to have learned how to tackle them. With these triangular pieces, even finding a good starting point was a challenge. While the end result of a 45 degree triangle is obvious, stacking the pieces to get there seems anything but obvious. I really enjoyed this puzzle, and it was certainly unlike many of the packing puzzles I've played with. A good challenge, and certainly solvable with a little thinking and some time understanding the interactions of the pieces. Go ahead and pick up a copy, you'll not regret it. Oh, and if this is too easy, Vinco has a harder version that's a little larger! It's been a little while since I sat down and wrote anything, and it's not for lack of puzzles to write about, but really because I've been so busy in my own shop making puzzles. With IPP looming, I had set myself some lofty goals of designing and producing my first exchange puzzle. That in itself was a lot of work, but I didn't stop there. I went on to make copies of Iwahiro's ODD Puzzle, then a small run of puzzles to give away to new IPP attendees, and then I took on my most ambitious project to date. I remade a Stickman box. 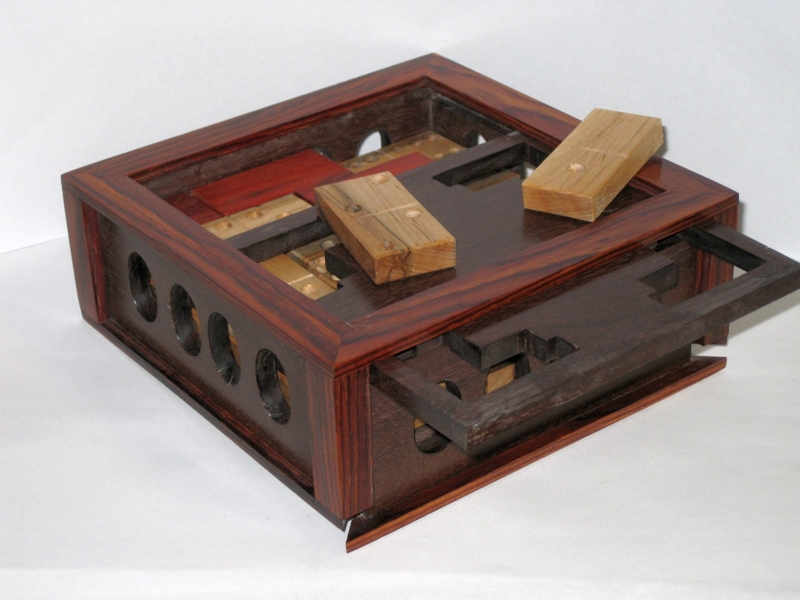 If you're a regular reader, you'll remember that some time back I won a Stickman Domino Box at auction, which needed a little work to turn it into a fully working Domino Box. 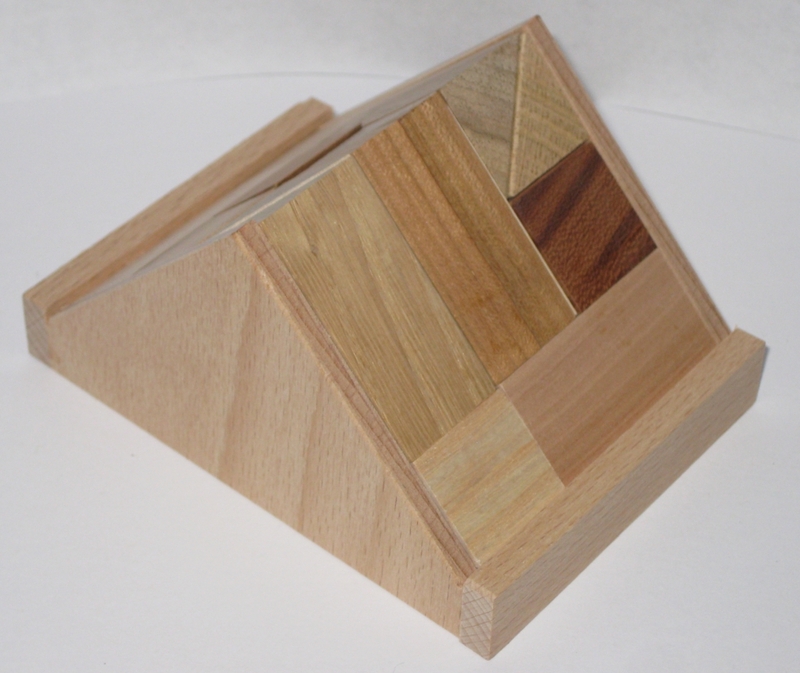 Having made the Dominoes, and learned a lot about the box along the way, I had the insane idea that I should make a few copies of the box for other puzzlers. 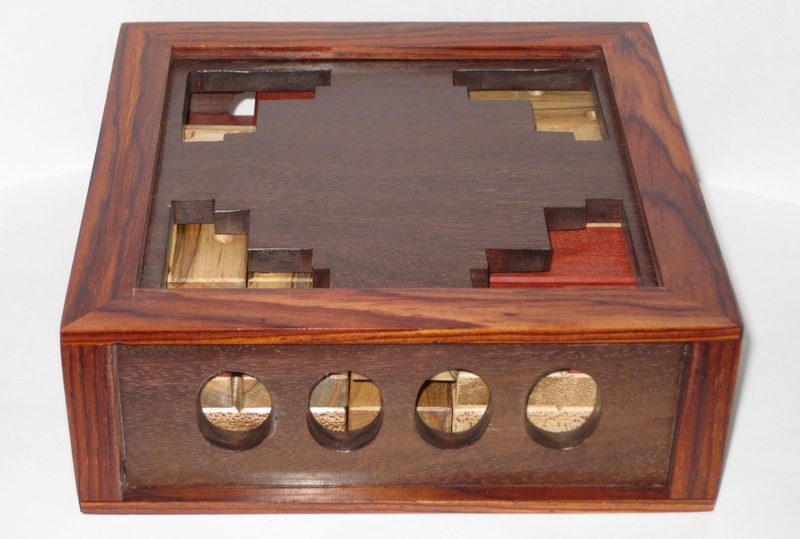 There were only 25 originals made by the Stickman Puzzle Box Company, and it's such a fun design, it really should be played with by more puzzlers. So with insanity on my shoulder, and time slipping away beneath me, I embarked on the most challenging project to date. 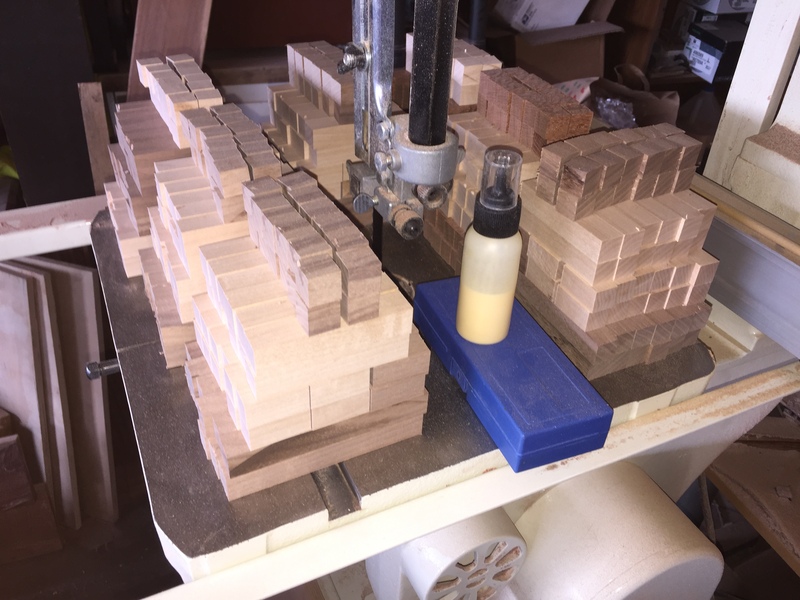 First off, I needed a new set of dominoes, so looking around the growing stockpile of exotic woods that I've purchased, I selected a number of boards, and set about the same process as before, and made a bunch of dominoes. I'll not go into the details, as I've covered them elsewhere, but in total I made up 11 sets of dominoes. 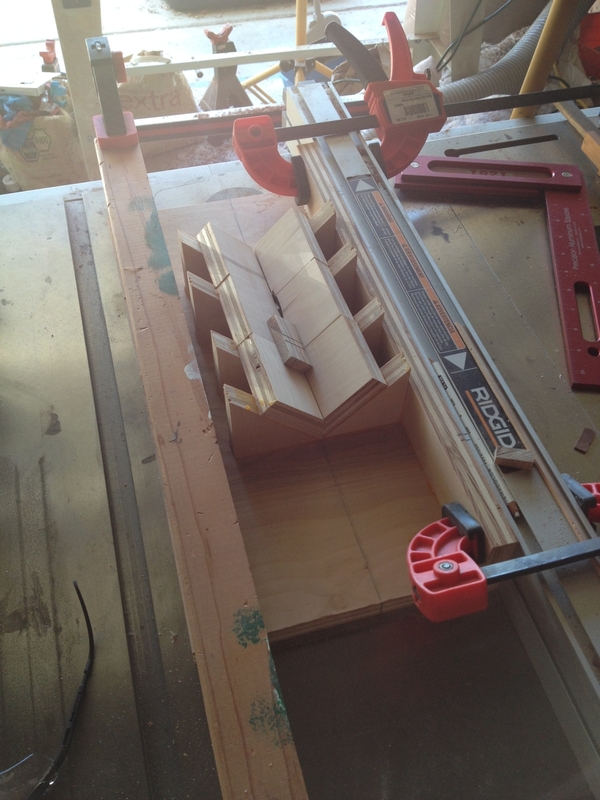 The last time I'd made the dominoes, I created the bevel on each edge using the router table, with a 45 degree bit. In fact that's how I've done all the bevels for every project so far. I've never been too happy with that as a process though. The pieces I tend to work with are a little small, and with a high speed rotating blade, it wouldn't take much for a piece to slip, and things to go wrong quickly. 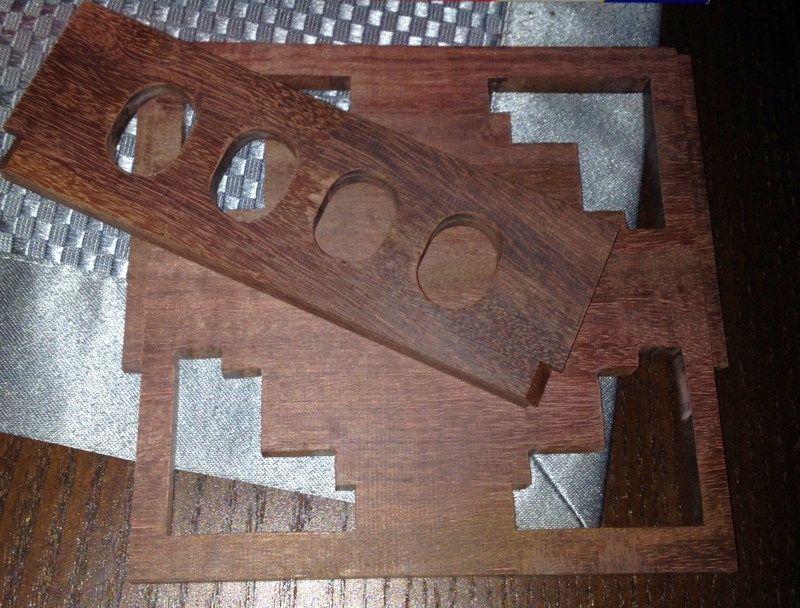 So taking some advice from fellow puzzle maker Eric Fuller, I created a new jig. As you can see, it's a 45 degree cradle, where the saw blade pokes out through the centre. This allows me to run the piece to be beveled over the blade pretty quickly, and the amount of the blade sticking out is so small, that it's almost impossible to stick a finger in the blade. Safety first! As you can see from the wider shot, the jig is clamped to my fence, and also clamped to the table, so it won't move anywhere, making this a pretty safe jig. It's also fast. Since I don't need to put a push block onto the piece, and then guide it over the spinning router bit, the whole thing takes much less time. 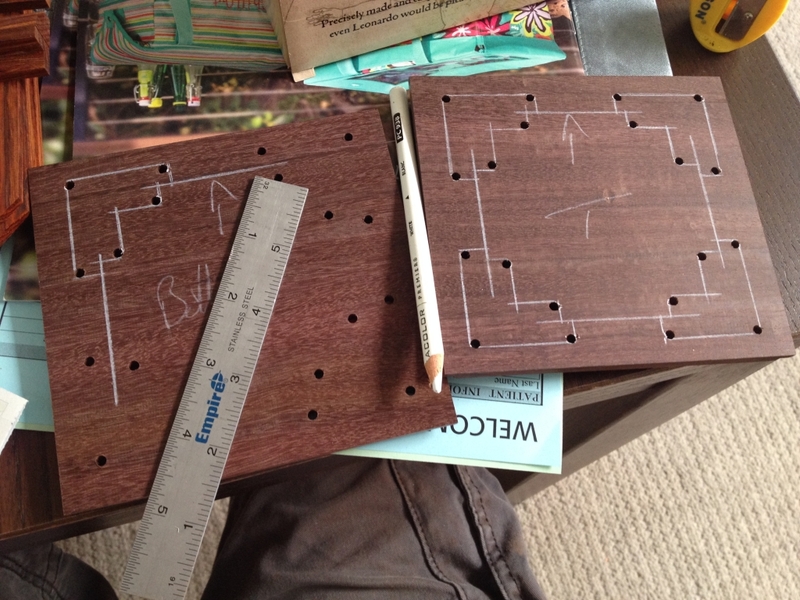 Much like the last time I made dominoes, I had the jig and templates to cut the dots or 'pips' for the dominoes. With 11 sets, or 308 dominoes, or 1848 pips depending on how you want to look at it, there was a lot more work this time round. I'd learned from the last attempt when I ended up with blisters from where the drill rubbed against my fingers, and taped up my fingers at the appropriate points to save any further blistering. Sadly, not everything went to plan. Around ¾ of the way through the process I hit a snag. My template drill bit exploded! The bit works by having a collar which is held onto the main body with an angled internal neck. So the collar can't come past that neck as it increases in diameter. The spring pushes it back to the point where the drill bit is covered, and when you push won inside the template the bit is exposed, allowing it to create a pip. Well it seems that since this drill bit made all the original sets of dominoes, it was just rather worn out, and the neck had work to the point where it no longer held the collar in place. With this, it was impossible to finish the dominoes, and I had to scramble to fins a replacement. Fortunately, Rockler sells the kits, and replacement bits ... so by mid week I had a replacement and could finish the pips. Dominoes complete, it was time to turn my attention to the puzzle carcass. 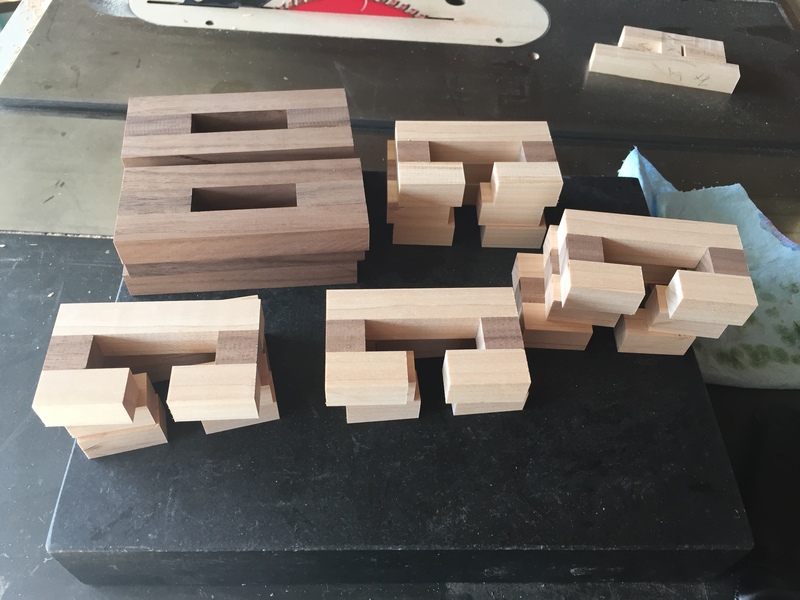 Before starting on making the boxes, I'd been studying the design of the joinery, and how the box had been made for weeks. I'll freely admit that I really didn't understand why Stickman had done things the way he had, but I had a good idea of what I was doing, and having taken lots of measurements, I proceeded to start making sawdust. Having surfaced and thicknessed the boards, I cut the basic side panels, the top and bottom, as well as the corner posts, and top/bottom frames. 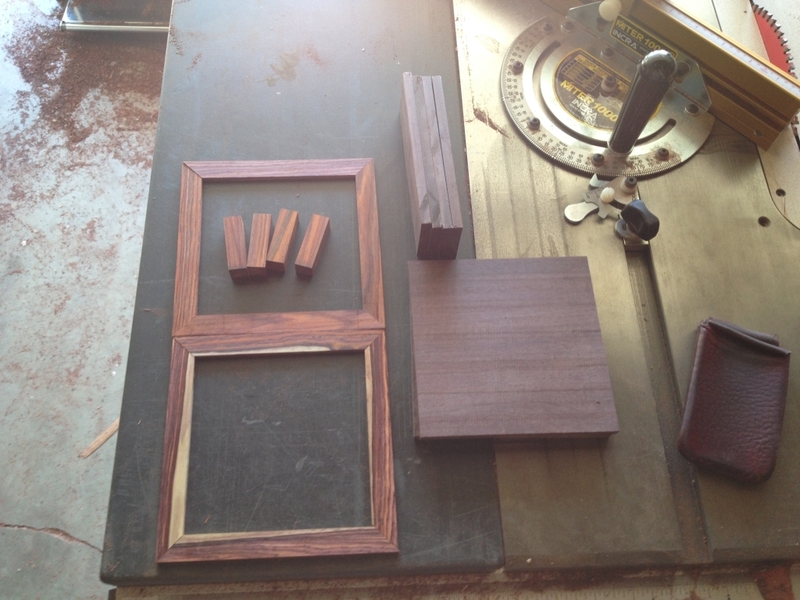 The wood choice was Katalox for the body and Cocobolo for the frame. The Katalox will darken over time to a dark black almost ebony like colour, but starts off as a warm rich chocolate brown. 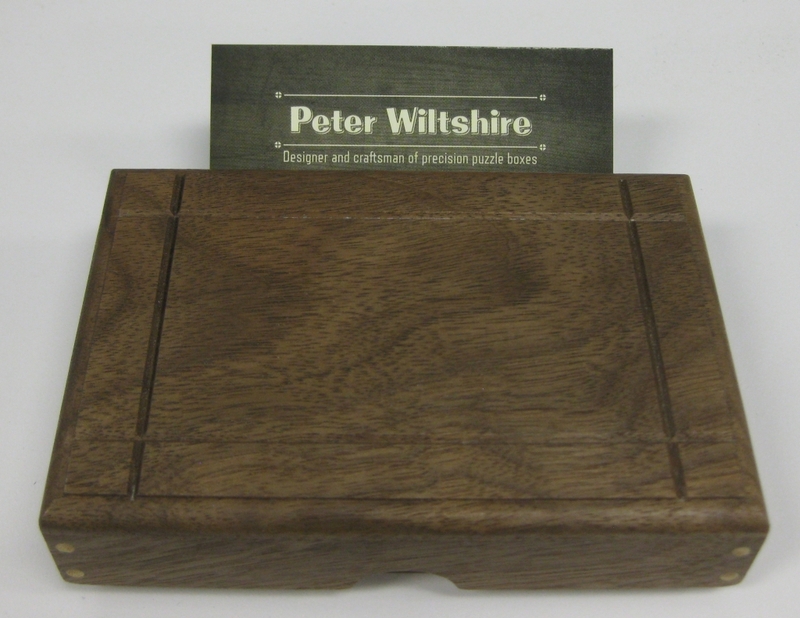 The contrast with the Cocobolo should be quite striking. After an afternoon's work, I had all the various grooves cut to both support the panels, and allow the top and front to slide respectively when the box is opened. At this point, I came in from the shop, and announced to my wife that Stickman is a genius. Having not truly understood why the box was created the way it is, and the reasons behind design choices, previously, I now fully understood why each piece existed, and exactly how it interacted. Not only is the construction a work of art, it also requires the minimal number of cuts, and pieces to make everything work perfectly. There is an elegance to the design that I hadn't appreciated. Having spoken with Stickman about it, he agreed. It's only once you've tried to repair someone else's work, or remake it, that you truly appreciate the process they went through to make the final design. And yes, I'm lucky to be able to talk to the original designer, and get his input and feedback as I worked through this project! With the main body cut and fitting perfectly, I turned my attention to the 'decorative' elements of the puzzle, namely the corner pillars. I'd cut the pieces to the right dimensions but needed to cut out the centre to create corner sections. My first pass on the saw left a rather fun little piece, but after a small adjustment, things were spot on. 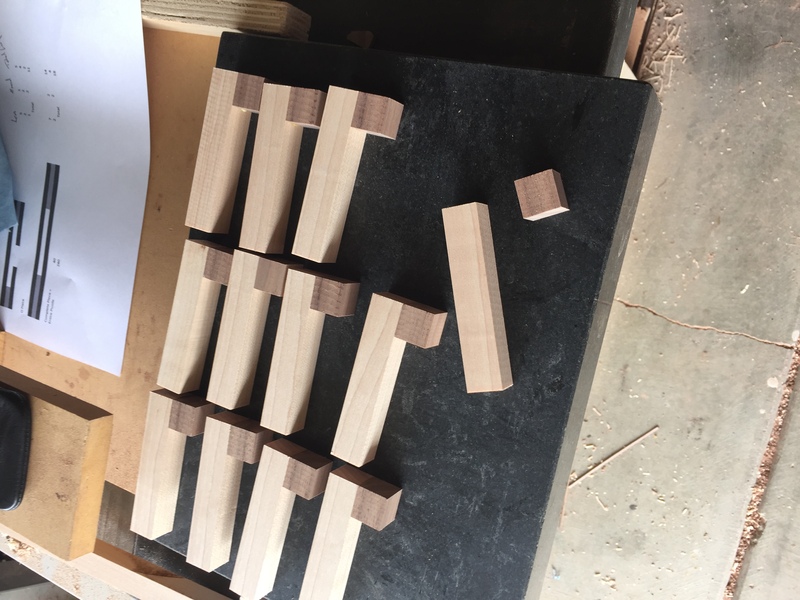 The joy of working with jigs is that you can make a small adjustment, re-cut, adjust until you're good, then just cut lots of exact replicas of a piece quickly and accurately. 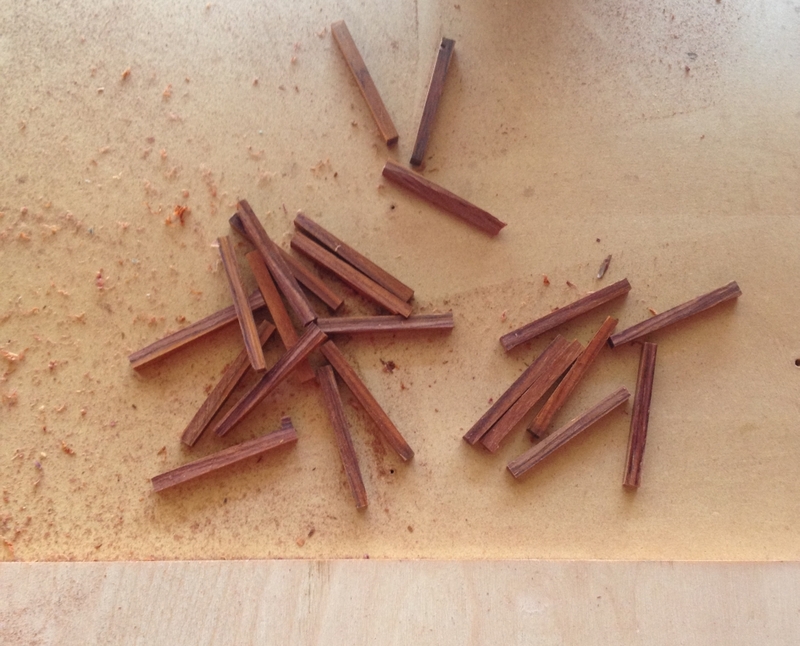 When cutting the corners, I was left with a lot of cocobolo matchsticks. As with any exotics in the shop, these all end up in a scrap bin, and will eventually be used for something else. Nothing gets wasted! 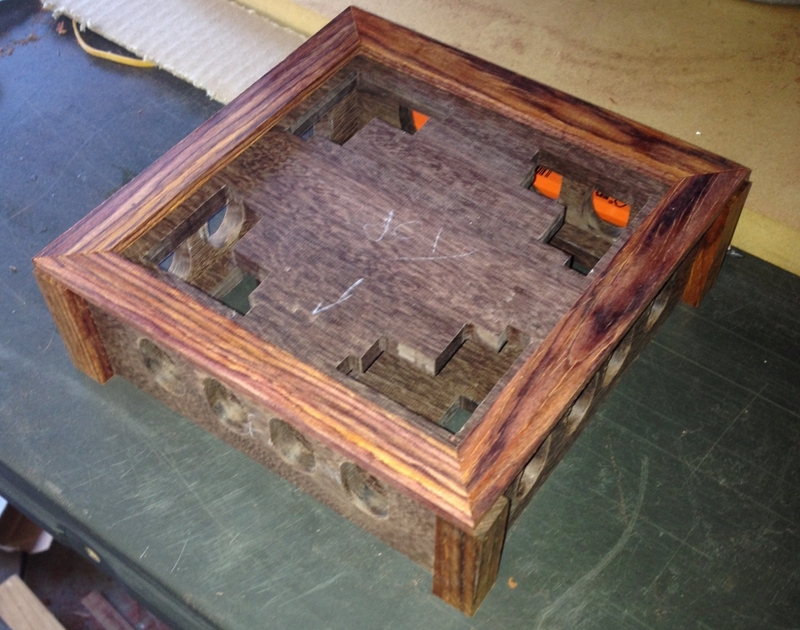 The original puzzle is peppered with holes and gaps. They're not just because Stickman wanted to make the puzzle lighter (although in my case, working with Katalox which is a dense, heavy wood it's not a bad thing) but they're integral to solving the puzzle. You need to be able to see what's going on inside, and be able to poke your fingers through the sides to manipulate the dominoes. 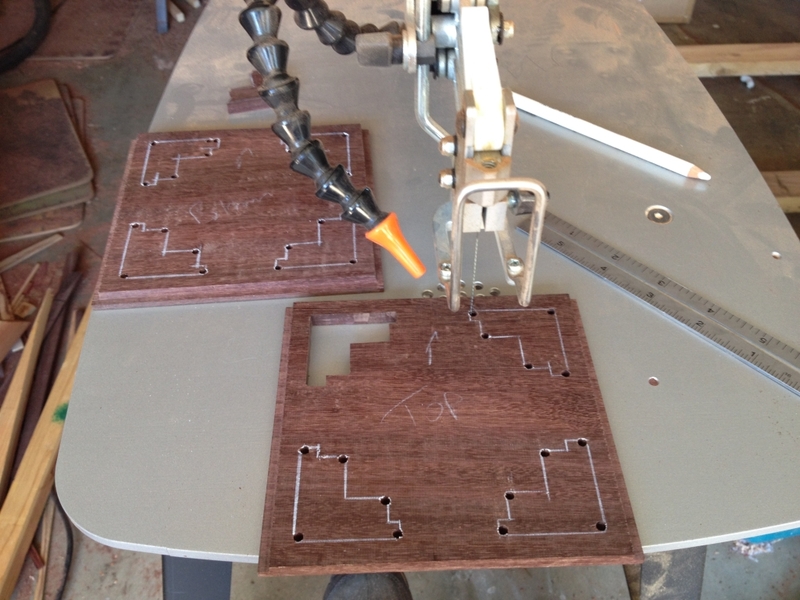 Stickman did all this work on a CNC machine, where effectively, he clamped the wood down, and let a computer controlling a router bit do all the hard work. I don't have a CNC machine, but I did need to replicate all the holes, and they had to be pretty close to the originals since larger holes would let dominoes escape. To create the ovals in the sides, I started at the drill press with a Forstner bit and drilled the centres out. 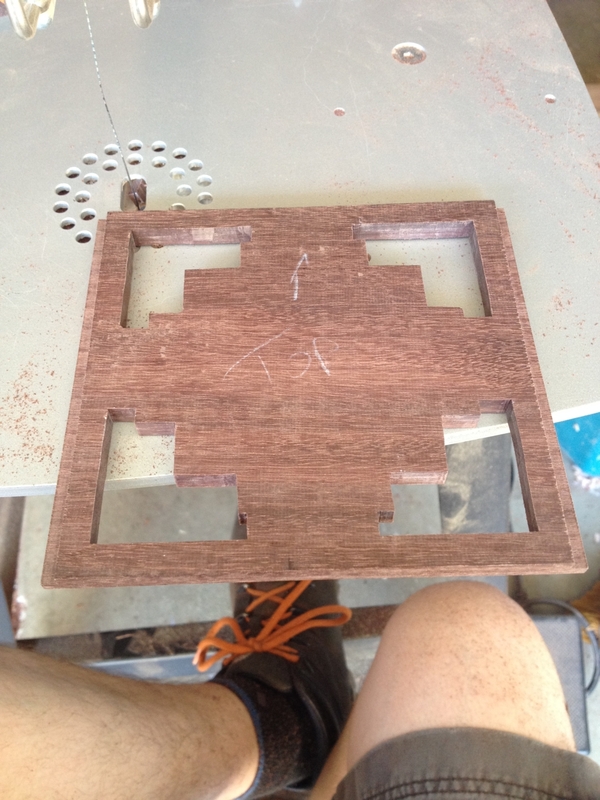 I had planned to then take the pieces to the scroll saw, and carefully cut out the ovals. Having tried this, on the first piece, I was entirely unimpressed with the result, and decided not to proceed with that method. Instead I went back to the drill press, and drilled an additional hole either side of the initial central hole, creating something close to an oval. Then I spent several hours with a Dremel to clean up the inside of the hole, and make the ovals smooth and consistent over all the panels. It might seem like a lot of work, but in the end it was a lot less work than my original idea would have been! Time for a game of "Join the Dots"
While I was drilling 'ovals' for the side plates, I also drilled a lot of small holes in the top and bottom to allow me to create the stepped holes I needed. There's no clever way for me to do this without the CNC machines, and I had to do this by hand. Drilling holes at the corners allowed me to insert the blade of the scroll saw, and cutout the holes I needed. By having a hole at each corner, I can easily turn the blade, and get square corners. Before I could start working at the scroll saw though, I needed to have a template to follow, so after a game of "Join the Dots" I had reference lines I could follow. This shows how the blade is inserted into the middle of the piece, and lets me cut out the hole without having to cut through the sides of the board. It might seem obvious, but there are very few tools in the shop that allow you to make such a cut, and the Scroll Saw is the only one that is close to safe, and accurate enough. The blade I was using cuts a saw kerf that is just 0.01" thick and leaves a very smooth finish, meaning that there was little additional work after cutting. Of course, I still had to take my time, and each plate took around 45 minutes to cut. With one panel fully cut, there were only 13 more to cut. Over the course of the next couple of days, I slowly worked my way through them (and a good number of fresh blades ... Katalox is dense and dulls blades quickly) before sticking some sand paper to a lollypop stick, and sanding the edges of the holes to soften them, making the piece much nicer to hold. With all the components cut, I could put the pieces together for the first time, and get a feeling for how the final puzzle would look. There was still a lot of work to be done before I could start gluing up the pieces, but this gave me a good feeling for the fit and the look of the finished puzzle. Given that I would have to glue the puzzle together with the front and top panel in place, I went ahead and pre-finished those pieces. Once they were in place and the corner posts were added, there would be no way to remove them or access the insides to be able to apply finish. 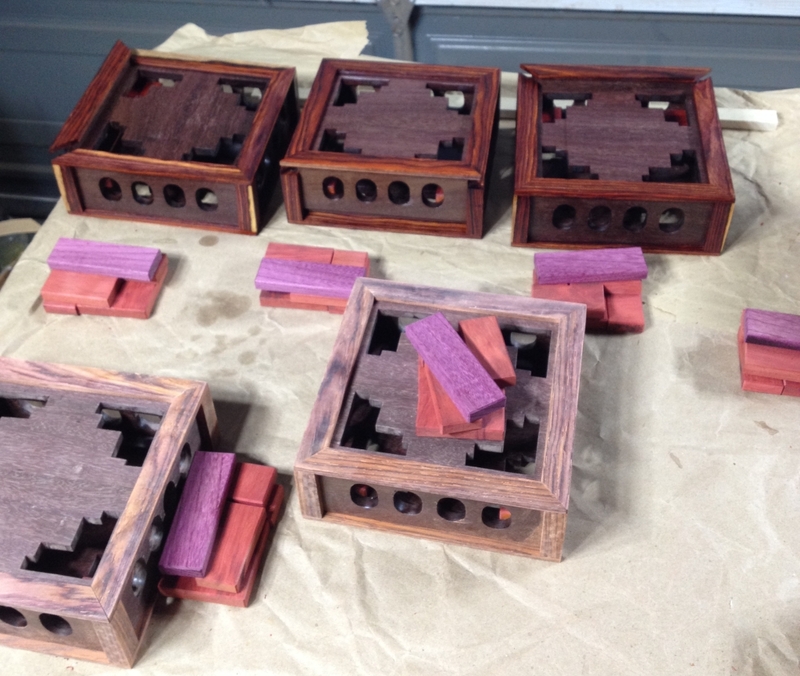 The other benefit to pre-finishing the pieces is that the lacquer and wax would help prevent the glue sticking to them, so if there was any glue squeeze-out, it wouldn't lock the puzzle solid. After all the work to get to this stage, that's the last thing I wanted! With the boxes mostly taken care of, the dominoes made, there is one additional element needed. 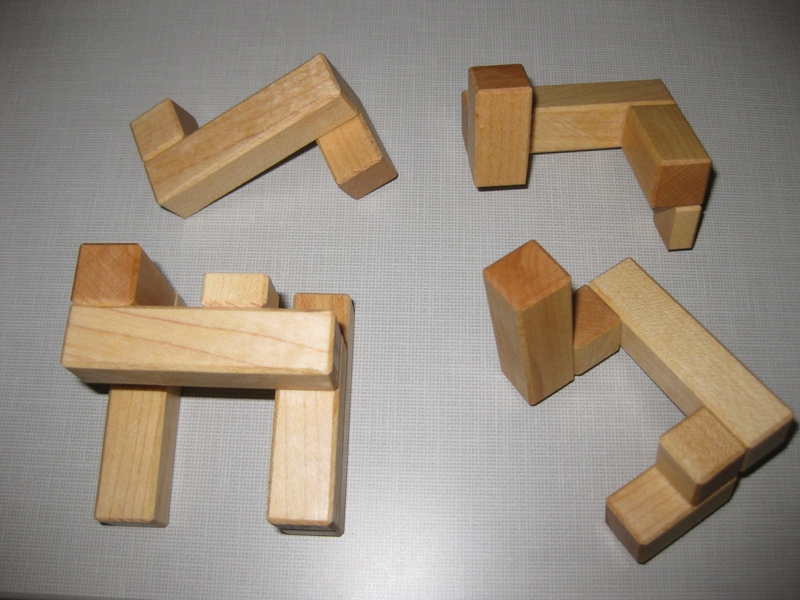 There are five additional pieces in various shapes that go into the box to make things more troublesome for the solver. 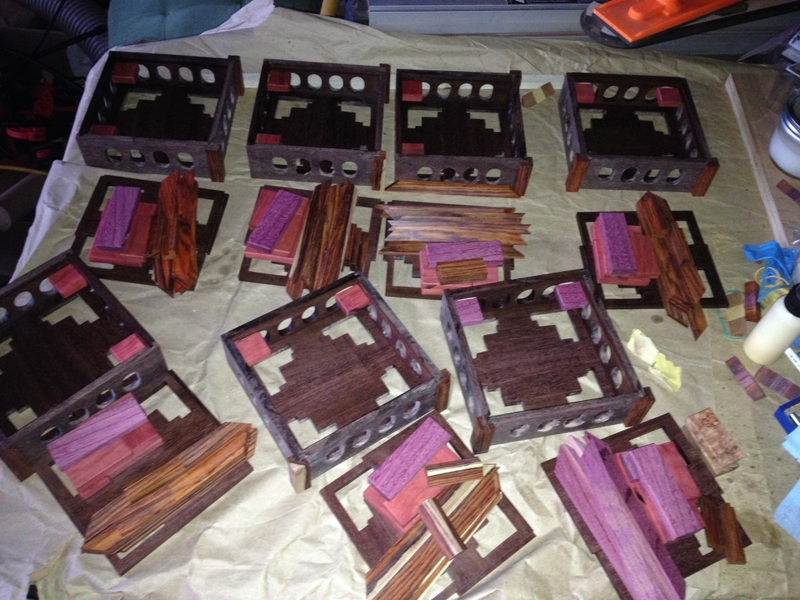 I decided to make these from Redheart and Purpleheart. 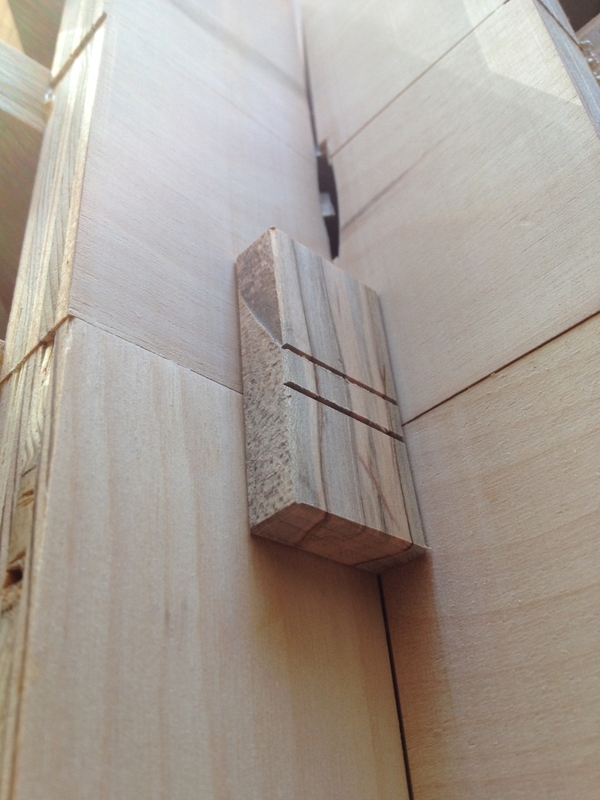 Each piece is a solid section of wood, and I cut the notches out of the piece. This gives me a nice continuous grain, and a stronger piece. Not to mention that there's less work for me to cut out a piece than having to cut twice as many pieces, and then re-glue them later. As with the dominoes, these pieces are passed over the bevel jig, to soften the edges, however there is a small problem. Given the internal edges it's not possible to get the blade into them. This meant that each internal bevel is cut by hand with a chisel. So lots of extra work from my side, but I end up with a clean consistent bevel around the pieces. Internal blocks glued in place, ready for the final glueup. 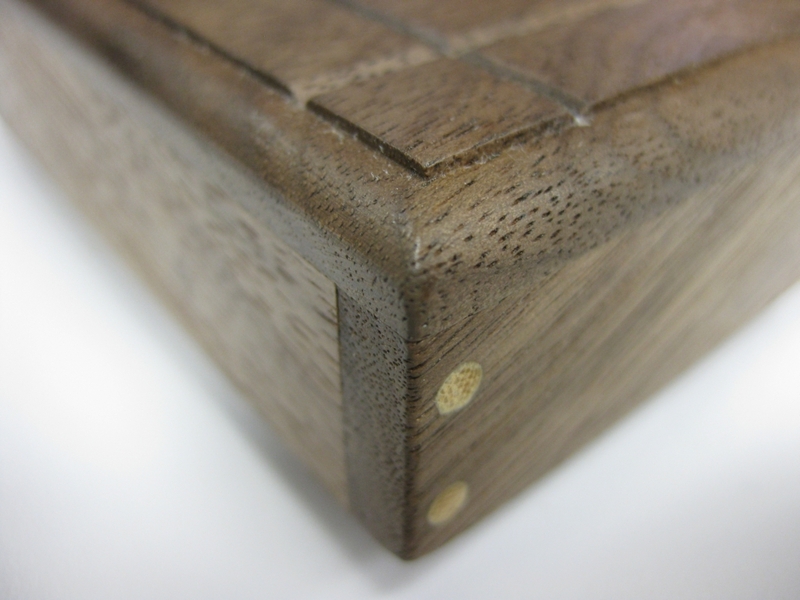 On the front panel, there are two blocks which are glued to the inside which are the final part of the locking mechanism. A gap needs to be freed below these blocks to allow the front panel to slide, and then the top to slide. 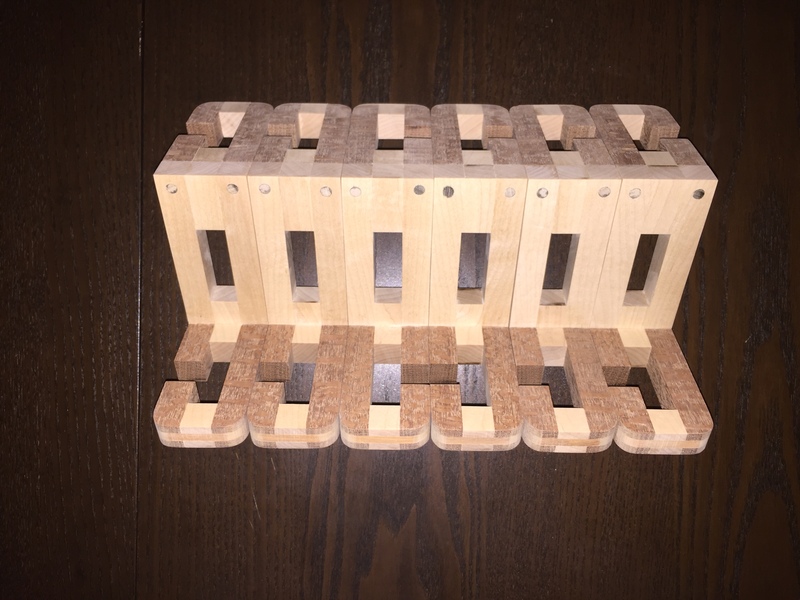 Each piece needs to be added at the right time, or you end up being unable to glue the piece in place, and end up with firewood rather than a puzzle. By this point it seemed like I'd spent weeks and still had nothing more than a pile of pieces to show for my work. The glueup for the box is rather complicated. 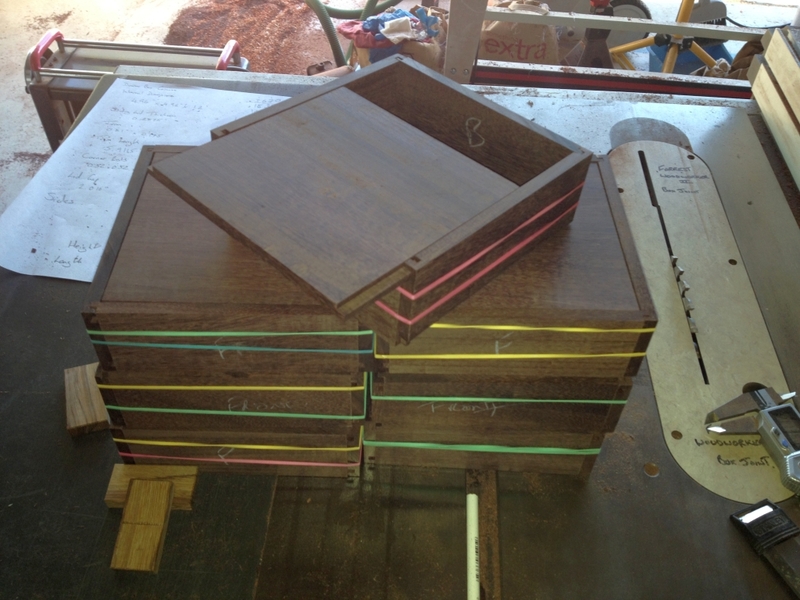 Unlike most other projects I'd tackled, the box can't be glued up, then assembled. The glueup is the assembly. The way things work is that the front panel, and top panel both have 'wings' which travel in the grooves of the side panels. In each panel, a section of the wings are removed to allow them to pass the pillars on the corners and the trim on the bottom. So when I mentioned earlier that Stickman is a genius, this is why. Those pieces which look like trim and decoration are actually integral parts of the mechanism. What is means is that for the glueup, the top and front are inserted, then the pillars are glued in place. This prevents the top panel from being removed again, so I had to make sure that everything was in the right place. So with the blocks in place, the pillars glued on, and a check that everything still moved, I could glue the top and bottom frames in place, finishing the glueup, and being the moment of truth as to whether I had a puzzle box reproduction, or some very expensive (and frustrating) firewood. 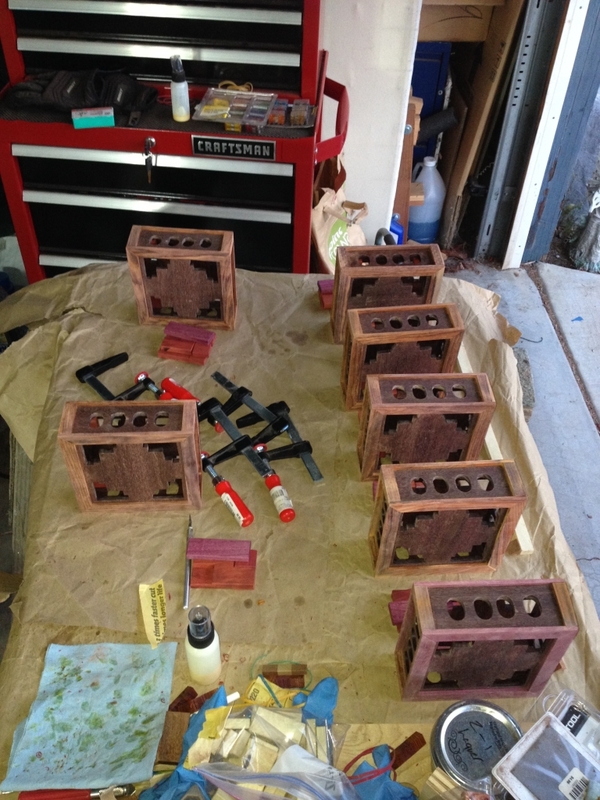 While the glue on the frames was drying, I clamped several boxes together back to back and clamped them together. 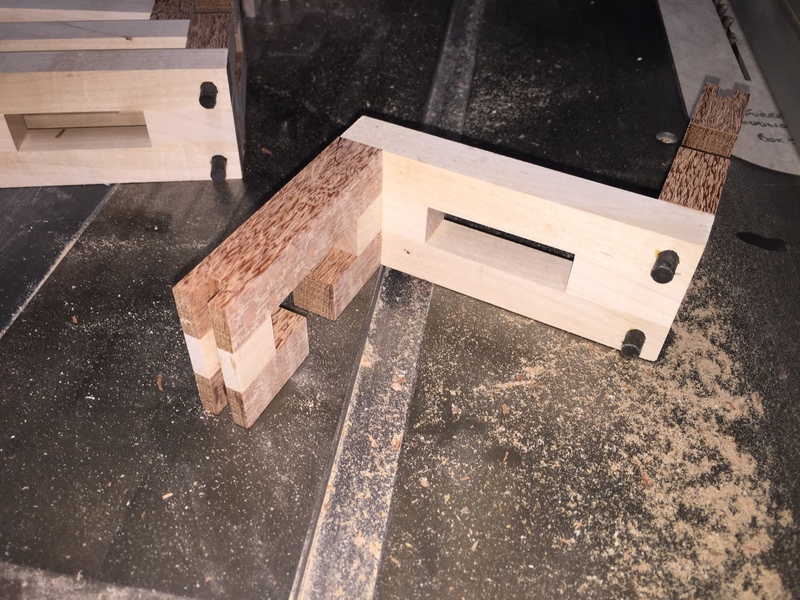 This meant that each box was providing a gluing jig for the one next to it, giving me good clamping pressure across the entire joint, and ensuring that all the boxes were identical. This is probably the most challenging assembly I've attempted, and I'm pleased to say that it all went very well. I've clearly learned a lot over the last couple of years, and having three times as many clamps today as I had when I started certainly doesn't hurt. 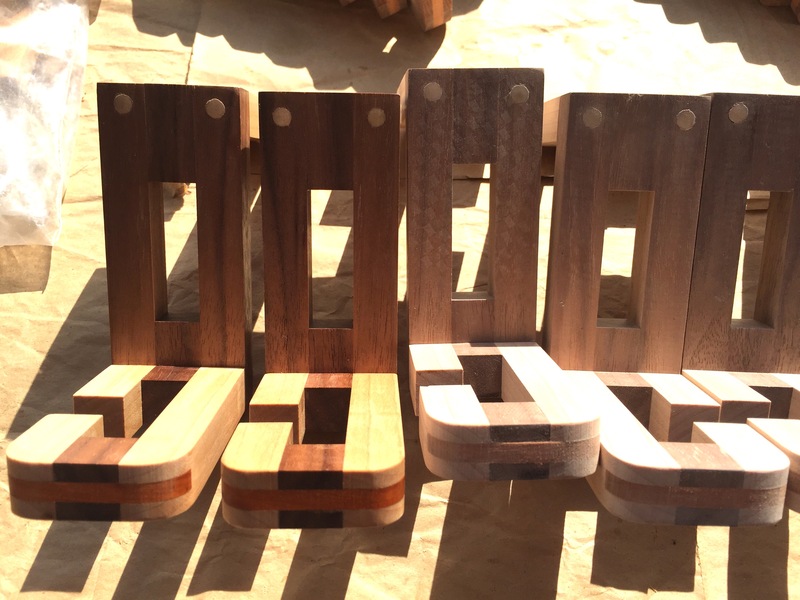 It really is true, you never can have enough clamps! The following night, once the glue was dry, I could finally test the mechanism on each box, and confirm that it worked as intended. You have no idea how much of a relief it was that each box slid smoothly and opened as expected... until the last box. The lid didn't come out past the front pillars! Fortunately, I have some sharp chisels, and I took a few thousands off the top of each of the front pillars, and the lid slid past. The amount I had to remove was so small, it's unlikely that even I could find the box I had to shave, but it was enough to stop things working. Fortunately, it wasn't a difficult fix. The last steps were to finish the puzzles. As you can see the boxes at the back where the first coat of lacquer has been applied really show the true colours of the wood, unlike the boxes at the front which look drab and liefeless without the finish. 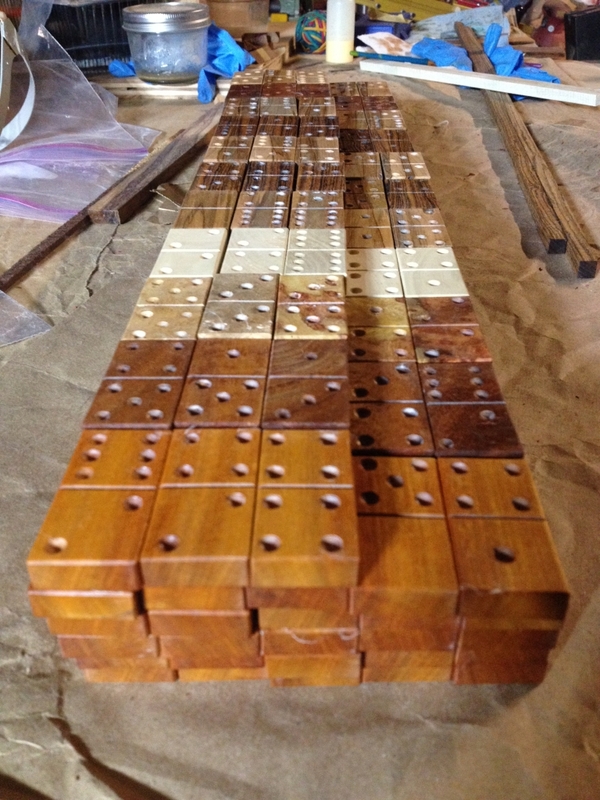 The final steps are to triple buff the puzzles and dominoes, to really make them shine. While I was working on the puzzle, I was posting images of the work in progress. Seems that a few of my puzzling friends have suggested that I could be "Stickboy". I might have taken that idea and run with it. Stickman seemed to like the idea, and agreed to let me use the moniker and a modified version of his logo. I also took his own logo, and created a much higher resolution version for use on Stickman's next project. After all, I was cleaning things up for my own use. Seemed silly not to let Stickman benefit from my work. After that, it's a simple case of putting the dominoes inside the carcass, mixing things up and passing them to a new owner. It's been an interesting project, and one I'm glad that I tackled. The question is which box do I tackle next? 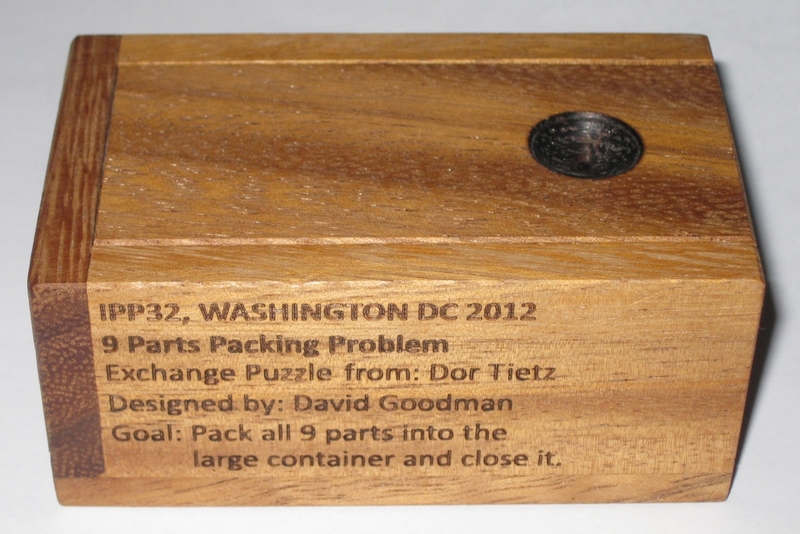 Another of the IPP32 exchange puzzles that I've been banging my head on for a while now is the 9 Parts Packing Problem designed by David Goodman, and exchanged by Dor Tietz. I travel to Israel for work fairly frequently, and as such I have the pleasure of meeting up with Dor, David and a few other puzzlers in the area for an evening of puzzling and good (non work related) conversation. This puzzle has been taunting me for quite some time, but having finally solved it, I feel that it's time I wrote about it. 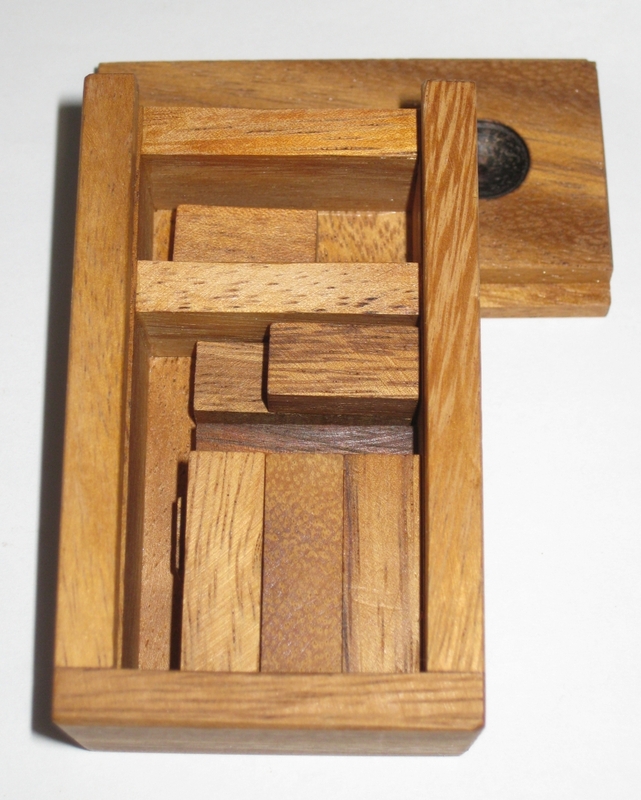 While the puzzle isn't made from fancy exotic woods, and there's no interesting joinery in the box, it would be easy to overlook this puzzle. I would suggest though that you don't overlook it. This is a very clever little puzzle, and one which I have struggled to solve for many (many) months. I'm not too proud to admit that I even went so far as to ask for help, posting both a picture, and a plea for help on Facebook, and had a few people send me hints. Nothing that told me how to solve it, but nudges in the right direction. None of them helped sadly. The puzzle sat on my desk at work, and taunted me for months. I've idly picked it up, had a poke at the pieces and put it back down with no real progress. I've tried blowing on it, spinning it, shaking it, beating it (it's very well made!) but nothing seemed to help. Then earlier this week, I picked it up , and noticed something about the pieces that I'd not noticed before. And moments later, the pieces were all neatly packed into the large container, I slid the lid closed, and sat back with a smug look on my face. (Then I got back to work, writing that document). This is a really good little puzzle, and well worth a play. If you're interested in trying to acquire a copy, give me a shout and I'll pass you David and Dor's contact information, to see if they have any left. I think you'll like it! Edit: Thanks to fellow puzzler Theo, who not only pointed out a mistake in my sizes above, but also made a copy for himself, having checked the dimensions with me, he found two solutions! I've corrected the sizes above, and looks like I'm back to trying to find a second solution!